Choose from two sizes. 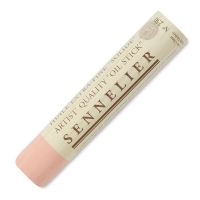 The 38 ml sticks are great for sketching and details. The larger, 96 ml sticks are perfect for broad coverage and bold strokes. 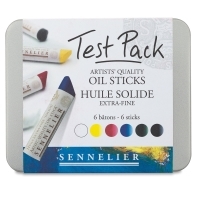 Oil Sticks Test Pack, Set of 6 — A great intro to Sennelier Oil Sticks, this set of six includes 12 ml sticks of Cobalt Blue, Ivory Black, Primary Red, Primary Yellow, Olive Green, and Titanium White. 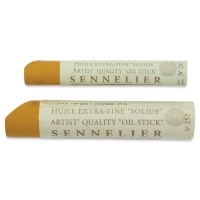 The tin measures 1½" × 5½" × 4½". 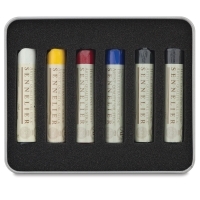 Set of 6 — Contains one stick each of Titanium White, Ivory Black, Primary Yellow, Primary Red, Primary Blue, and Viridian.